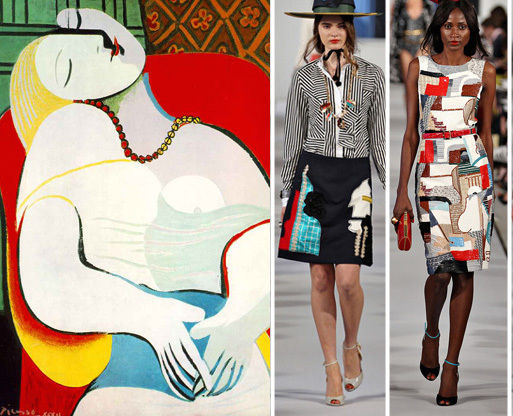 (Left): Picasso’s Dream , (Right): Oscar de La Renta 2012 collection inspired by modernism in terms of colors, lines and shapes. When we think of fashion, we all think of art, there’s a strong connection one can not ignore, in fact I think of designers as artists with a highly creative talent with just a simple garment they get to turn things out beautifully. However, to attain this they need to be inspired, history showed us that nearly most designers got their brainstorm from a certain art movement or piece for example in 1965 Piet Mondrian paintings become the reason behind the Yves saint Laurent “ iconic cocktail dress” collection design. 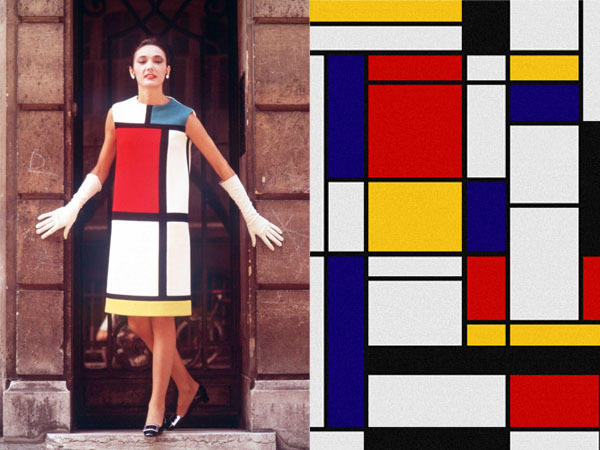 (Left)The Yves St Laurent dress was inspired by the abstract paintings (right) of the Dutch De Stijl artist Piet Mondrian It became known as the Mondrian Collection and was featured on the front of French Vogue in September 1965. Oscar de La Renta (the founder) was known to be an outstanding talent , believed that everything bought inspiration from amazing woman he met ,to his roots, nature and travels. Born in the Dominican Republic 1932, as known to be a Spanish colonial going back 500 years in history, left school to study art in Madrid he then was trained by Cristobel Balenciaga. All his designs were so clear that he was so inspired by the Spanish Culture. His eye recognized every detail he was so influenced by the great history of Spain, from its flamenco gypsies to the provincial shepherds heavy wool capes, coats and eventually he would showcase his own exclusive signature in Paris. As quoted in his legendary world of stylebook he would recreate Andy Warhol flower paintings, turning them into a print for a day dress with slanted pockets and a soft draped neckline 1. The art paint done was an outcome of a photograph of several hibiscus flowers. How can impressionism developed in the 19th century be translated into today’s fashion, its all about light ,color and breaking free from rules . In other means a direct message was told, and basically that was what Oscar was able to display in all his collections. His connection with impressionism was very clear by the way he designed his dresses at his earlier design stage and later on his career life where he created a feminine refined silhouettes, and soft ruffles. He just had something about layers of ruffles or petal like layers of silk flowers, he was so inspired by the beautiful nature of his hometown. He always designed delicate impressionist prints making his dresses a wearable art. Most of his dresses were either delicate in fabric or had this painterly floral prints ,fitted bodice with a peplum. How more feminine can a lady get while wearing his gowns . He refined the ladylike looks , he stayed loyal to his classical elegant theme . Fashion today, is simply influenced by all forms of art, such as music, photography , painting, to a certain history era. Art is a way of life that we live and by the way we dress we can share a mutual message, that we are similar in mind, taste and lifestyle. I think that art today is a universal language that can connect people together from all around the globe ,fashion is a piece of art that designers created from a simple fabric to a stunning piece of admiration that we see on catwalks. Fashion shows that we attend now are more exciting and thrilling than ever before simply because designers are getting creative even on how they showcase their collection believing in the say “ presentation is everything”. 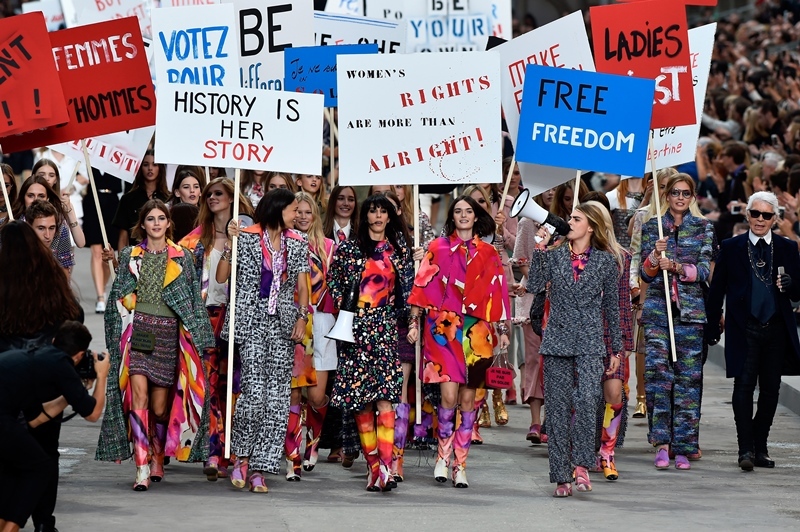 Karl Lagerfeld for an example used his Spring /Summer 2015 fashion show in Paris to make a political statement. He acknowledged the feminism and peace issue and bought it to stage , while showcasing his collection that woman have equal rights to men. Finally, since most fashion shows are hosted in museums and galleries this proves that art and fashion are inseparable they complete each other in every aspect. Together they create a fun vibe and attract a lot of attention to the collection and brand. Fashion today truly plays a vital role in an economy and its society so let’s hope those amazing designers continue to grant us with more glamour and creativity.